Welcome to Aria da Capo! 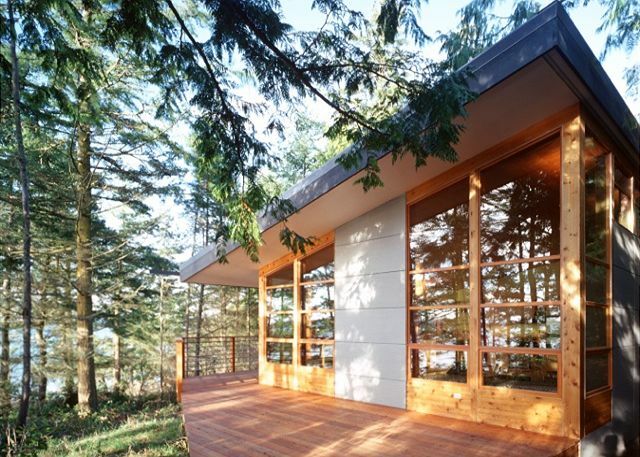 This beautiful, newly constructed, modern home looks through the trees at the waters of the Salish Sea. Walk up the steps and across the deck to enter the home through the french doors to the left. 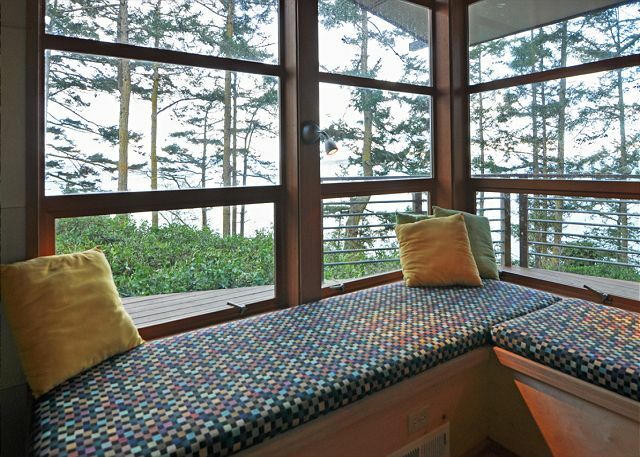 Welcome inside; a matching pair of windows and window seats invite you to sit down and enjoy the gorgeous setting. What a spot to relax with a good book! The open floor plan is focused on the waterfront. The home is built with an intriguing choice of materials that lends to the sense of being somewhere special. The kitchen and dining area are modern and contemporary; a wonderful place to prepare and enjoy your meals. Both bedrooms open onto the side deck. Enter the master bedroom and you'll find a cozy queen size bed. The master bath is accessed in the hallway. 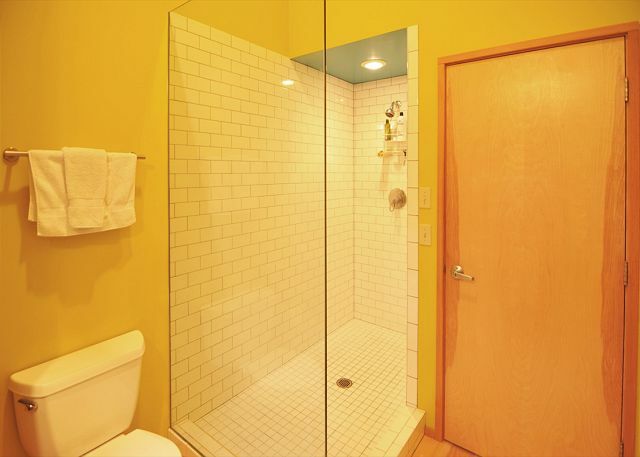 And features a large tiled shower. The guest bedroom offers a double bed. Here is a second view of the double bed. The guest bath is also well equipped. When you want to head to the beach this trail will take you there. Wow! A private beach. This vacation is getting pretty good! Aria da Capo awaits your every vacation desire. Before we go, here is one more picture we think you'll like - magnificent sunsets viewed from the house! Beautiful location, very clean home, peaceful and yet very close to the center of town. Would definitely recommend this property. Also, I wish I remembered the name of the kind lady who helped me with this reservation. I loved talking to a "real" person who was very professional and much better than the usual VRBO rental process, which I have done 7 times! Thanks for the help in renting Aria da Capo. We stayed here while visiting my parents who live on Lopez. The house is clean, light and well equipped. It gets amazing late afternoon sun. We had many memorable meals and times on the deck. Wonderful setting, beautiful house, great location! This place met & exceeded our every expectation for a Lopez vacation home. The architecture is simple, efficient and takes full advantage of its private wooded site. Beautiful sunsets and beach below, ample deck but insanely squeaky! Thoughtful staples, beach towels, even a bike available to use. Lots of classical CD’s & some jazz, too few DVD’s, games & kid books (hint: check out Lopez Library). Too bad owner didn’t provide local nature & outdoor guides. Beautiful interior daylight & window seats but kind of dim for reading & games at night in LR. Unusual bunks-in-hall arrangement not great for getting kids to sleep and not awakening them by grownups later. Strongly recommend putting queen bed in guest room. Double not comfortable for tall guests (which all ours were). Location very central yet remarkably secluded. Lots of herons down the way at Fisherman’s Bay. Enjoyed exploring island’s fabulous scenic spots by bike, hiking & kayaks. All around excellent choice. We’d love to return, but may opt for a place that allows 8 next time. Go for it - you will be thrilled by this place and go home refreshed! Set up, location and amenities perfect for our family of 5. Bonus was their great library! A quiet, relaxing weekend on Lopez. The house was secluded, very clean, and close to the beach. Had a great time in this modern, well-equipped, well-stocked home. Close to village yet still very private. Great ventilation, excellent sleeping weather, even in August. Beautiful views, hardly noticed neighbors. House is shoes off, should you care. Only downside: the deck squeaks very loudly with every step. We decided it doubles as the alarm system. A great first Lopez experience. Loved the house, location and views. What we didn't love were the beds and bedding. The mattresses are old and very uncomfortable. The pillows also uncomfortable and the pillows on the spare bed had a horrible smell. If these issues were rectified I would return, if not, I'd try another place first. 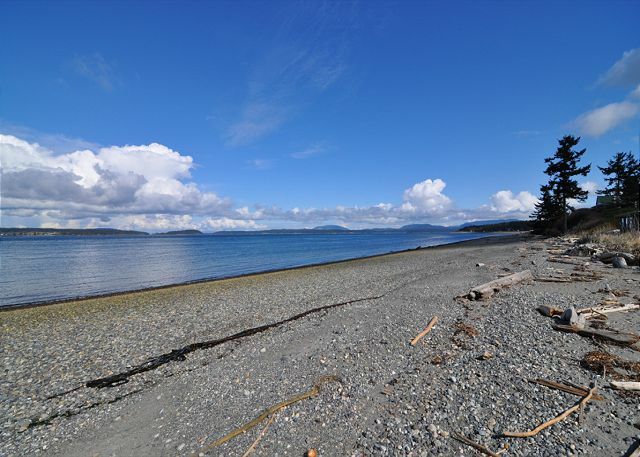 Well equipped, deer in the yard, Eagles everywhere- these islands are paradise! Our recent week long stay was wonderful. The house is modern with lots of charm. Very comfortable for the 3 of us. The driveway in is narrow and dark and needs a couple of small trees removed. The setting has a lovely western view. The site is fairly heavily treed. This home was wonderful for our family. We love the modern design & convenient location. The view is beautiful. We would definitely stay here again. Two minor suggestions: put screens on some of the windows so bugs don't come in when the windows are open and do a little tree trimming to further open up the view. We were looking for a not too large but comfortable house to relax and escape from the "real world" for a week. This house fit the bill perfectly. The living area is situated perfectly to just lay back, relax and enjoy the views. The house itself is very nice, and it's in a good location. The neighboring homes are closer than expected, the bed is small and uncomfortable, but otherwise the house is great. Such a lovely quiet and secluded location with so many windows and a creative use of space. From the moment we pulled onto the wooded drive we knew this was going to be an exceptional experience. The house is hidden from the road and presents a plain side as you approach. However, the house is an architectural delight. It is like being in a tree house above everything. We spent hours sitting on the cozy and comfortable window seats watching the wonders of nature. The house is very comfortable and perfect for multiple people who want their solitude. Two separate bedrooms and baths with a kitchen that can support even the most complicated of dinners. We only left to buy groceries and the morning paper, and to walk on the beach. The house and the experience were more than we ever could have expected. We can't wait to go back. Lopez is a jewel and Aria Da Capo is perfection. It doesn't get any better than that! Aria da Copa was even better then the pictures. The weekend we were there was sunny and bright. Enjoying the morning light and evening sunsets in a relaxing private house was unbelievable. The house was clean and modern. The kitchen has all the basic coking tools you would need. My husband and I had a wonderful time at the house. It's in a secluded and quiet spot, but it's a quick drive to the village for groceries and restaurants. There are neighbors close by, but the house still felt private, especially since no one occupied the closest home while we were there. The beach is also an easy 5 min walk down the hill. Eagles flew by often and we even saw porpoises and seals from the deck. The house is modern in design and had everything we needed for a comfortable stay. CDs and games were nice to have and internet worked great. We thoroughly enjoyed our stay at Aria da Capo. The house has a lovely setting, with westward views that are especially enchanting at sunset. We enjoyed dinners al fresco on the deck as the sun went down. We were 4 adults, the ideal capacity. The location--conveniently close to the village, yet very private--was perhaps the best aspect. We had a great experience except for a couple of things. 1) The outside garbage cans had not been emptied after the last guest so when we tried to add garbage, it was difficult. 2) There was no kindling or matches set up for us to use even thought this was listed in the site instruction book. 3) When we arrived, we had trouble getting the key box to work. We tried calling but there was not enough cell phone service to be able to reach the office. None of these things kept us from enjoying our visit. A good time was had by all once we actually found the house. Fabulous house on Lopez Island - the house is as described and shown in the pictures - in a nice quiet neighborhood, as well. Great view from the deck and everything you need - the B&W bookshelf speakers and a small collection of classic jazz CD's was a nice touch. Everything was clean and in working order. You might miss your 60 inch TV from home, but you are on vacation...step away from the TV!! 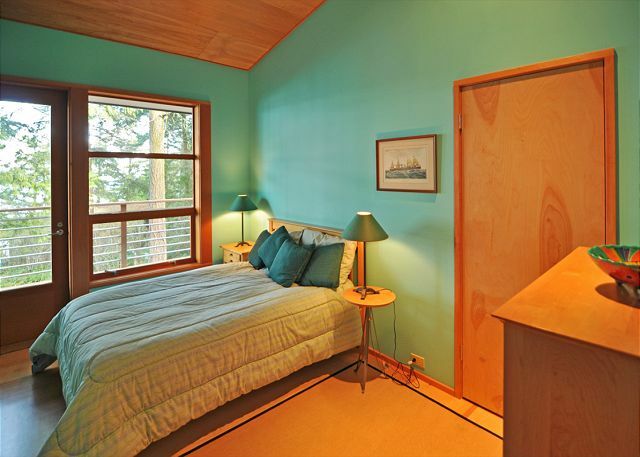 Would definitely recommend this house, Lopez in general, and the Lopez Island Winery. Don't miss the Galley, Vita's and Love Dog for restaurants. The speedy return of deposit upon returning home should also be mentioned. If you like a relaxed vacation and maybe some biking too, you can't go wrong with this house. Awesome Property - Highly Recommended! We were delighted to arrive at the rental home. Beautiful home, wonderful location -- just as you see in the photos. Everything was perfect!! It was a beautiful home in a great location. The pictures do not do the view justice. 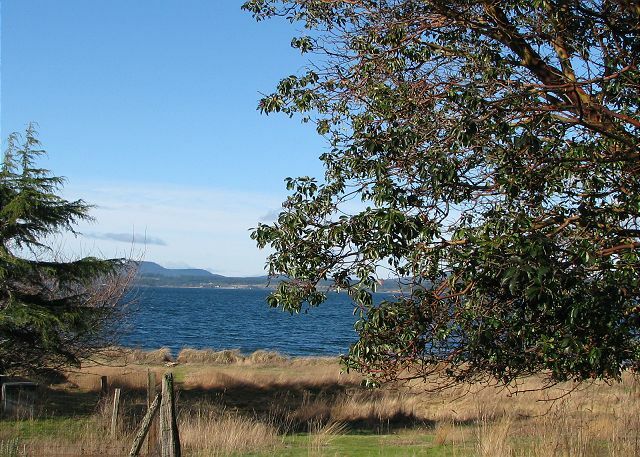 We awoke every morning to flying geese, enjoyed each evening watching the porpoise and sea lions in the sound and even enjoyed a visit from an eagle. Oh yeah, and the house was great too. 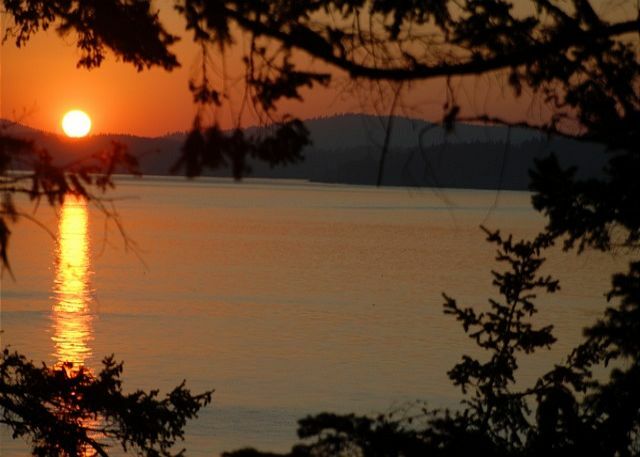 We were captivated nightly over the amazing sunsets over the neighboring islands at this west-facing house. The neighborhood was quiet, the house is well-equipped and we loved every minute. We had a wonderful stay at Aria da Capo! The house was very private and well appointed. Two things of note- there were no window coverings so early morning light and privacy were a bit weird and it is not quite as close to the water as I had anticipated. Otherwise a wonderful home in a wonderful location! Very comfortable house. Really. Well equipped, great location, liked the window seats. Light, airy, great accommodations for 2 couples and 2 teens. dream home and dream vacation! We really loved Aria di Capo. This exquisite home overlooking the water was quiet, relaxing, lovely and luxurious. We really enjoyed watching the endless sunsets and seeing birds and sea life right out our windows. We brought four girls for a slumber party and they had a blast. 2 bedrooms and two small bed cubbies in hallway great for kids. Clean, light filled and refreshing stay. Comfortable furniture and a well equipped kitchen. This property is in a beautiful location - is very private (there is a house close by but it was empty). Modern and minimalist and very comfortable. The housekeeping was less than desirable with dirty dishes and pots and pans in cupboard - however the property manager was very responsive to my email regarding this and answered immediately offering to send housekeeping for a complementary clean of the house. Very nicely done - I would definately return and will rent from this management company again. A very lovely spot -- quiet, spacious, clean. Enjoyed the nearby beach and the beautiful vantage point for sunsets and sunrises. Really felt "away from it all" yet had all that I needed close at hand. Loved sipping wine or coffee in front of the fire and simply staring out at the lovely view. Very nice house, well outfitted for our two week stay. The house has lots of character, and has a lovely western sunset view through just a few trees. We had hoped that the beach was closer to the house, but it was a very brief walk down the road, and the beach itself was wonderful, a great walking beach. Our daughter loved sleeping in the bunk with the big porthole in the hallway (one of two such bunks) but it meant we had to keep things pretty quiet in the living room once she went to sleep. Lots of lovely windows, felt like a treehouse. We were entertained several evenings by the slapping of seals in the sound just below the high bank where the house is perched. The ample (and humorously squeaky) porch was our outdoor living room. We very much enjoyed the house, and would recommend it to friends. Stayed here for three days and had a great time. Previous review mentioned not enough cookware but this must have been addressed because it was not a problem. Fireplace was nice one night, views are great, two bikes were available to ride. Was furnished with just about everything you need. Very nice grocery store 5 minutes away, made for very comfortable living and eating (grill worked great). Beach access was a 5 minute walk or 2 minute bike ride. Good day hiking on the island. Small golf course. Highly recommend staying here. (no TV cable, just TV for movies, can rent movies at the grocery store, WI FI worked good). We had a great time at this house, the views are great and it is a good place to relax in a quiet atmosphere. The property is in great shape, but we would have appreciated a few more touches to make the home more enjoyable for a week-long stay (the quality of the kitchen supplies leaves a lot to be desired if you want to cook with any regularity, the furniture is not very comfortable). These are just small quibbles to provide feedback, we had a great time and I recommend this house.